These stamps come from Croatia's ephemeral 1941-1945 incarnation as an Axis puppet state. Here we have Dr. Ante Pavelić, genocidal bossman of Croatia, looking extremely sinister. If you look at the photograph this design is based on, his expression is somewhere around resolution or determination, but the heavy shading around the eyes and the mouth here gives him a strongly malevolent appearance. So this is a delightful design, but perhaps not necessarily in the way that was intended. Designer of these stamps was Karl Seizinger, who had a rather storm-tossed career. A journeyman stamp and banknote engraver, he could find no work in his native Germany and so moved to Czechoslovakia, where he designed many of that country's solid but unexciting issues of the 1920s and 1930s. Fleeing Prague to avoid the Nazis, he ended up in Yugoslavia, where he got a bit of stamp work done before it was also overrun by the Nazis. This time he stayed put and, living in Zagreb, he designed several issues for the new fascist regime in Croatia. 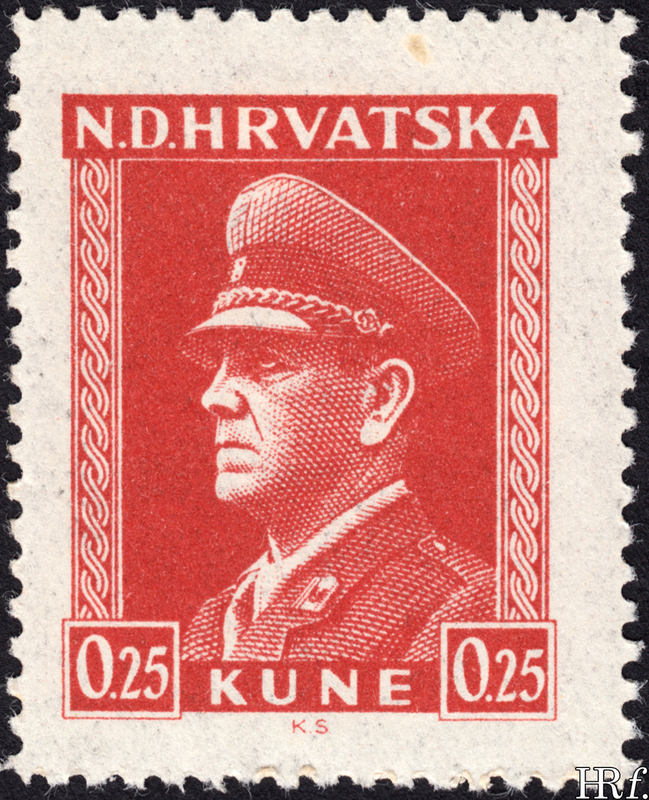 He got out of Croatia at the end of the war, but his collaboration with the Axis made him an unwelcome figure in Czechoslovakia when he tried to return there. Eventually he settled down in the Netherlands, where he designed stamps for Dutch colonial holdings and the United Nations(!). He died in 1978 and was eventually posthumously rehabilitated in Czechoslovakia. This is the entire issue, essentially. Certainly it's all the values: there are several obvious variations here in size and paper quality and presumably these have a more specialised taxonomy somewhere. Overall quality of these isn't terrible, actually: the design itself is strong and the printing is reasonable, with the badness of the paper as the main flaw. I have no idea where these were printed, or under what circumstances, but with the Axis retreating on all fronts in 1944 presumably conditions were a little sub-optimal. Croatia was ultimately (re-)incorporated into Yugoslavia after the war. Pavelić escaped Croatia as well (abandoning his followers to their fate at the hands of the victorious Communists), and settled in Argentina: he survived an assassination attempt in 1957 (by a Serb royalist, unexpectedly) but died in 1959. This issue is very commonly seen in unused condition, for reasons I'm not aware of: the Yugoslav government rounding up old stocks of these and selling them to dealers is probably the most likely cause.